Gnani means wisdom attained through self reflection. A Series of Lessons in Gnani Yoga by Yogi Ramacharaka contains lessons and thoughts on Gnani (also spelled Jnani) yoga, the yoga of wisdom. Although the somewhat stilted and old-fashioned language may be difficult for some modern readers, the timeless truths contained within have helped many yoga students explore this branch of yoga. The actual author of A Series of Lessons in Gnani Yoga by Yogi Ramacharaka is an American named William Walker Atkinson. Atkinson's works flourished in the early 20th century. During this time, many Indian yogis, mystics and teachers traveled to America to introduce yoga to the Western world. Interest in Eastern thought grew in England and the United States and authors like Atkinson published numerous volumes on yoga and other topics. Like many of his contemporaries, Atkinson "borrowed" an Eastern-style pseudonym to pen his books on yoga. During Atkinson's time, many authors selected such names for added credibility. Readers expected anyone writing about Eastern topics to have an Eastern name. Atkinson's most popular pen names included Swami Bhakti Vishita, Swami Panchadasi, and Yogi Ramacharaka. You can find other books on yoga by these authors, all of them believed to be written by Atkinson. Atkinson's publishers printed a "biography" of Yogi Ramacharaka when questioned about the authenticity of the teacher. The Yoga Society, publishers of Atkinson's works, claimed that Yogi Ramacharaka was born around 1799 in India, where he studied yoga. His disciples included Baba Bharata, who came to America and met Atkinson. The two then co-authored numerous books. Unfortunately, many inconsistencies and inaccuracies in the published story hint that it is fiction and most scholars believe Atkinson and Ramacharaka are the same man. No matter who authored A Series of Lessons in Gnani Yoga, the book remains popular today. Truth seekers find within its pages a timeless philosophy of wisdom inviting them to explore their minds to attain truth. There are numerous types of yoga. Most Westerners are familiar with Hatha yoga, the foundation of most yoga styles, featuring body postures to calm the mind, enhance concentration, and build physical stamina. Other types of yoga include Raja yoga, a discipline espoused by Parmahanasa Yogananda, author of one of the most famous books on yoga ever written, Autobiography of a Yogi. The history of yoga lists and explains the various disciplines. Yogi Ramacharaka's book deals with one style, Gnani yoga. Gnani means "wisdom", from the root word gna. In Sanskrit, gna means "to know". Gnani yoga often attracts people who prefer study and research in their quest for enlightenment. By examining metaphysical principles, researching intellectual topics, and studying philosophy, these yogis follow a path of knowledge. The practitioner of Gnani yoga asks the question: "Why?" He then finds the answer within. Mediation for the Gnani yogi means release of preconceived notions to behold the truth resting quietly within oneself. The Lessons by Yogi Ramcharaka help students release their minds, examine facts within, and meditate upon the truth to find enlightenment. People mistakenly search for truth outside of themselves. The truth may be found within, by studying one's own thoughts and motivations. Gnani yoga is not a religion, and does not conflict with religious ideals. Rather it is more of a philosophy or way of thinking about topics related to truth and ideals. Practitioners examine all thoughts as if they were new, judging for themselves the veracity of each thought. Gnani yoga holds the philosophy "The Absolute IS". This means that absolute truth can be known through study and contemplation. First, read A Series of Lessons in Gnani Yoga. 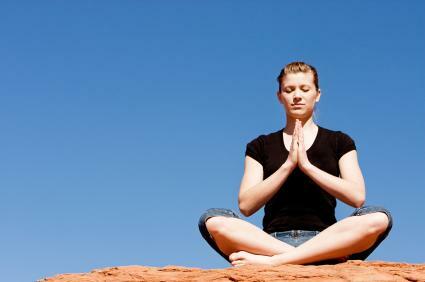 Next, begin quiet meditation periods, training the mind to examine each thought. Let thoughts pass before you as if they were simply on a big movie screen. Detached from the thoughts, you can examine them and determine for yourself if they are reactionary or true to you. True practice of Gnani yoga involves more than this simple introduction, so be sure to review this book and other writings, or find a teacher at a yoga school near you. The full text of A Series of Lessons in Gnani Yoga by Yogi Ramacharaka is available on Amazon. The eBook version is available on Many Books. For a fascinating read, check out the biography of Yogi Ramcahraka (William Atkinson). To explore Gnani yoga in its original context, visit Gnani yoga pages. Yoga World features a lengthy discussion on Jnani yoga.